Summer brings together an odd juxtaposition: We want to get together and have fun and eat, but it's often in settings that have us in swimsuits or other clothing that doesn't hide as much as we'd like. Well, there are ways to grill healthy and enjoy fine company. Weight Watchers has passed along a series of recipes that include common ingredients fixed in uncommon ways. •Seared Salads: Take a break from ordinary lettuce, and substitute it with those favorite vegetables; such as asparagus, squash or red peppers. Serve in a bowl as a traditional starter, or pile in paper cones to encourage mingling at outdoor get-togethers. •Beefless Burgers: While extra lean ground beef (93 percent lean) is always a smart favorite, why not try a patty with a punch; like salmon, tuna, chicken or turkey? Bulk up these burger alternatives by adding chopped vegetables or fruits, as well as low calorie sauces or rubs. Nestle burgers onto a whole grain bun or pita for added fiber and flavor. •Side Pockets: Not every side needs to be served in a dish. Put it in a pocket – a tinfoil pocket, that is. Tear off a 12 inch sheet of foil and fill with sliced red potatoes, onions, herbs and salt and pepper. Fold over the foil and seal tightly until veggies are tender, turning at least once. Grilling in foil locks in flavors and nutrients, and makes for easy clean up. •Sweet Endings: Swap the cakes and cookies for Mother Nature’s favorite dessert – fruit. Make a tropical treat with easily prepared fruit kabobs. 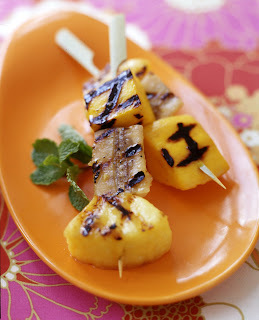 Fill water soaked skewers with chunks of bananas, pineapple and mangos and sear over the fire. For extra flavor, lightly brush with a touch of melted butter, brown sugar, ginger and rum. •Barbeque Burn: Most main dishes take about 20 minutes to cook on the grill. That’s just enough time to burn off some extra calories. Grab the kids, toss the Frisbee, or simply go for a brisk walk. A person who weighs 150 pounds can burn nearly 100 calories simply by playing with the kids for just 20 minutes. •Grilling Get-Togethers: Studies show those who lose weight together, do better than those who try it alone. A monthly barbeque with friends is a great way to experiment with new low calorie recipes and share in each other’s weight loss efforts. Challenge your friends to bring one new weight loss tip or recipe to the gathering to share with everyone else. Bring summer items that no longer fit for a clothing swap to help bolster each other’s wardrobe through the season and to encourage each other to maintain their healthy lifestyle. Snap off tough ends of asparagus. Place asparagus, onion, bell pepper, squash and zucchini in a large heavy-duty zip-top plastic bag. Combine balsamic vinegar and next 8 ingredients; pour over vegetables in plastic bag. Seal bag, and shake gently to coat vegetables. Marinate 30 minutes, turning bag occasionally. Prepare grill. Remove vegetables, discarding marinade. Place vegetables in a grill basket. Grill, uncovered, over medium-high heat (350°F to 400°F) 22 minutes or until slightly charred, turning often. Mix chicken, oregano, garlic powder and feta together in a medium-sized bowl; divide mixture into four balls and then press them gently into patties. Grill or broil patties until internal temperature of burgers reaches 165°F, about 7 to 8 minutes per side. 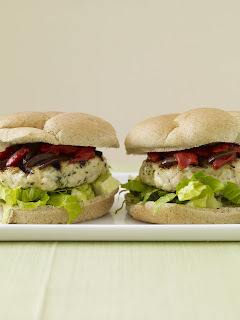 Serve each burger in a pita with a lettuce leaf, 1/2 of peppers and 1 teaspoon of olives. Preheat grill to medium-high or heat a grill pan over high heat. Combine sugar, butter, ginger and rum in a small saucepan; heat over low heat until well-combined, about 2 to 3 minutes and set aside. Alternate pieces of fruit on each of 8 ten-inch or 16 six-inch metal or wooden skewers (make sure to soak wooden skewers in water for about 20 minutes to prevent charring); brush with sugar mixture. Place kabobs on grill or grill pan and cook until grill marks show on bottom side of fruit, about 1 to 2 minutes. Turn kabobs and grill until marks appear on other side, about 1 to 2 minutes more. Serve hot, room temperature or chilled. Yields 1 large or 2 small skewers per serving.